This beachfront condo is fully equipped and ready to welcome you for your relaxing vacation on the Worlds Most Famous Daytona Beach. 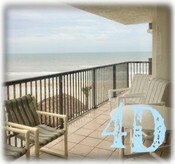 Open the door to a comfortable 2 bedroom 2 bath remodeled unit with delightful beach decor. Enjoy the beach, just steps away from the the oceanfront deck with heated pool and barbecue grill, tables, umbrellas, chairs & lounges. "Very nice condo! Clean throughout, and well-supplied with dishes, cookware, good appliances. Nice deck. Beautifully tiled, updated bathrooms. (The only tiny drawback is that there isn't a bathtub in either bathroom.) My family enjoyed their stay there very much. Thank you." This vacation rental has been viewed 2,029 times since 06/03/2018. Each property is independently owned and operated. All listing information has been furnished by the property owner/manager. Please read our disclaimer.